Fitted with a private terrace or balcony, this fan-cooled room includes a personal safe, seating area and a private bathroom with bath or shower facilities. Fitted with a private terrace, this air-conditioned room includes a personal safe and and a seating area. Private bathroom comes with bath or shower facilities. Fitted with a private terrace, this air-conditioned room includes a personal safe, flat-screen TV and a fridge with a minibar. Private bathroom comes with bath or shower facilities. This single room has a tile/marble floor, air conditioning and seating area. Set amidst tropical gardens, Hotel Lusa at Kuta Beach features an outdoor pool and a restaurant with open-air dining area. It operates a 24-hour front desk and provides free Wi-Fi access in public areas. Kuta Beach and Beachwalk shopping mall are a 5-minute walk away. Featuring Balinese-style interiors with modern minimalist designs, rooms in Hotel Lusa at Kuta Beach are cooled by air conditioning or a fan. A private terrace or balcony is attached to each room, which also comes with a personal safe and a seating area. Some rooms have a TV, fridge and a minibar, while bath or shower facilities are provided in each private bathroom. Car rental can be arranged on site. Every morning, Indonesian breakfast is served in the shared dining area. A variety of shops, bars and restaurant can be found within a 5-minute walk from the property, while Ngurah Rai International Airport is 20 minutes' drive away. Please note that the property requires a full payment via PayPal or bank transfer on the day of booking. Staff will contact guests directly via email for payment instructions. when I need to stay in Kuta. Lusa Hotel will be my choice. Good value for money and friendly staff. Very friendly and welcoming staff. Great service. Lovely gardens. Lovely pool area. Breakfast were served within a good time-food was fresh and good.Staff once again very friendly. Nothing. Great value for money. Great location for beach & plenty of restaurant options. Good traditional family-run hotel. Best personal in kuta, 2min walk to the beach, good place to meet other travellers. Don't do it, there are plenty of better Hotels nearby! There was nothing to like, the hotel is dirty and unkept. There was years of grime running down the bathroom walls, the sheets and towels were poorly laundered, the pool area and gardens were rundown and unkept. We booked for 4 nights and left after the 1st night. I have stayed her for many years & this time i booked for a week & left after one night after I arranged alternative accommodation. The rooms were absolutely filthy. Toothpaste scum over the bathroom sink, walls that were absolutely filthy along with bathroom.Because I booked through BOOKING.COM the staff were unable to give me a refund. Great location and value for money. some staff very friendly and helpful. pool area nice. Not the cleanest. Also unable to use a hairdryer as apparently it cuts the power to the whole building ! complete nightmare. Also staff were not very helpful in trying to sort out this issue. Power cut off about three times in an hour. staff did not seem to be happy. Gutes Hotel, einfach aber günstig. Für alle Surfer zu empfehlen, die gerne in der nähe des Zentrums, beim Beach aber trotzdem in einem ruhigen und guten Hotel schlafen möchten. One of my favorite places I stayed in all of Bali. Everything was well maintained and the gardens were beautiful. It didn't seem like you were in the middle of Kuta at all. Very close to everything, yet quite and serene! I would recommend this place to anyone who travels to Kuta. For less than 300K Rp. you get yourself a nice place to stay. Set in a buzzing seaside neighborhood with cobblestone streets, this Dutch Colonial-style casual hotel is a 3-minute walk from the white sands of Kuta Beach, a 4-minute walk from markets and discos along Legian Road, and 4 km from Circus Waterpark-Bali. The simple rooms feature free Wi-Fi, TVs and en suite bathrooms, some with only cold-water showers, along with minifridges and air-conditioning or fans. Freebies include airport pickup and Indonesian breakfast served in an open-air restaurant. 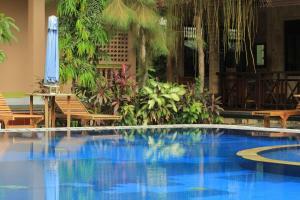 Other amenities include tropical gardens and an outdoor pool surrounded by coconut trees.